A new artistic director shakes up American Theater Company. THE GANG&#8217;S ALL HERE And they&#8217;re pretty freaky in P.J. Paparelli&#8217;s columbinus. Raven Theatre, the stalwart storefront troupe in Rogers Park, announced its 2007–08 season last June. In between Tennessee Williams and Neil Simon was something a bit surprising. The company, which over the years has tended toward the likes of Albee, Miller and Mamet, would present the Chicago premiere of columbinus, an interview-based play conceived by PJ Paparelli, the artistic director at Perseverance Theatre in Juneau, Alaska. 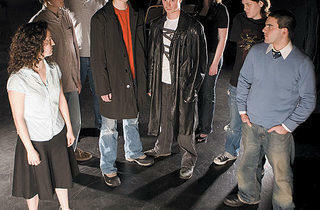 The work, which explores the events leading up to the Columbine High School shootings, would require a cast of eight young actors, none of whom would come from Raven’s ensemble. But the real surprise would come in September, when American Theater Company announced that Paparelli would move to Chicago to take the reins as its artistic director. He arrived in November, with ambitious plans for ATC. At Perseverance, Alaska’s only professional theater company, Paparelli was able to forge a powerful connection with the community; Juneau’s a town of less than 35,000 people, but Paparelli says 10 percent of them attended Perseverance. He hopes to achieve that kind of loyalty again at ATC—only with a much smaller theater and much more competition. Paparelli has a laundry list of new ways for ATC to ask those questions. The theater, which was already in the planning stages to build a new, larger facility in Logan Square, is also expanding its staff, including hiring an executive director. That beefed-up infrastructure should help Paparelli implement the programming augmentations he has in mind, which include using ATC’s in-place acting ensemble as a carrot to attract big-name playwrights. Paparelli has other tricks up his sleeve for establishing associations with playwrights. He’s setting up a workshop program with some of the country’s top playwriting schools; Juilliard is the first to be announced. “It’s a way to catch a playwright right before they go kaboom and allow them to claim a home,” he says. ATC is also launching a nationwide new-play contest and calling it the New Deal, as well as an outreach program pairing writers with teens from Christopher House in its new neighborhood. “The challenge is allowing everybody [at ATC] to feel in a place of risk, to push themselves to do something they’ve never done before,” he continues. “columbinus was that for me. It was the most frustrating, terrifying, financially unstable thing I’ve ever done.”The play is based on interviews not just with residents of Littleton, Colorado, but also with teens from across the country. The first half of the show presents episodes from these kids’ lives; as the show progresses, it becomes clear that the setting is turning into Columbine, and two kids emerge as Dylan Klebold and Eric Harris. “As you move into the second act, the fiction becomes fact and the people become real,” the playwright says. The impulse behind columbinus, to explore what created an environment in which school shootings are a reality, is related to ATC’s mission of asking big questions about America. columbinus is in previews at Raven Theatre, opening Sunday 27.